(Cannon Beach, Oregon) – One museum on the north Oregon coast will go back some two million years on February 18. That day, the Cannon Beach History Center & Museum will host Dr. Cameron M. Smith, of Portland State University for a presentation on human migration. The program starts at 7 p.m. (Photo above: the Cannon Beach History Center & Museum). Dr. Smith will be presenting human migrations and dispersals over the past two million years, which is the topic of Smith’s latest book Atlas of Human Prehistory. Over the years Dr. Smith has published several books on varying topics from evolution to space exploration. Dr. Smith has a PhD in Archaeology from Canada's Simon Fraser University and is a respected scholar, who has published scientific works in the American Journal of Physical Anthropology Magazine, South American Explorer, Spaceflight, Skeptical Inquirer, The Next Step, The Bulletin of Primitive Technology, and in Scientific American. He has also appeared on PBS, The History Channel, and on the National Geographic Channel. The earliest stone tools of made by relatives of humans were found to be 2.5 million years old, so Smith's talk will take prehistory of Man to a whole new level. Smith is an engaging and active presenter who has spoken on various topics around the world. The event will take place at the Cannon Beach History Center & Museum. The Museum is located at 1387 South Spruce Street in Cannon Beach, Oregon. This presentation is free and open to the public. Seating for this event will be limited. For more information about this event visit the Cannon Beach History Center’s website, or call 503-436-9301. February 13. Fort George Festival of Dark Arts. One-day carnival of stouts is the centerpiece to Fort George Stout Month, a month long celebration of the darker ales. $40 for stout drinkers - $10 for non-drinkers and minors. Also live music. Fort George Brewery. 1483 Duane Street, Astoria, Oregon. (503) 325-PINT. Febuary 10. Haystack Rock Series. Dr. Debbie Duffield, Oregon State University, Talk titled “Marine Mammals, the Marine Mammal Stranding Network and Marine Reserves." 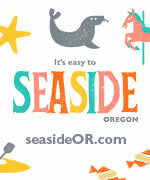 7:00 to 8:30 p.m. at the Cannon Beach Library, 131 N. Hemlock St. Cannon Beach, Oregon.